On 15 December 2009, France and India issued a call for proposals from the international scientific community to exploit data from AltiKa, a high-resolution altimeter dedicated to measuring oceans, continental waters and ice. Satellite-borne altimeters determine sea level by bouncing a radar signal off the surface and measuring the return-trip time. 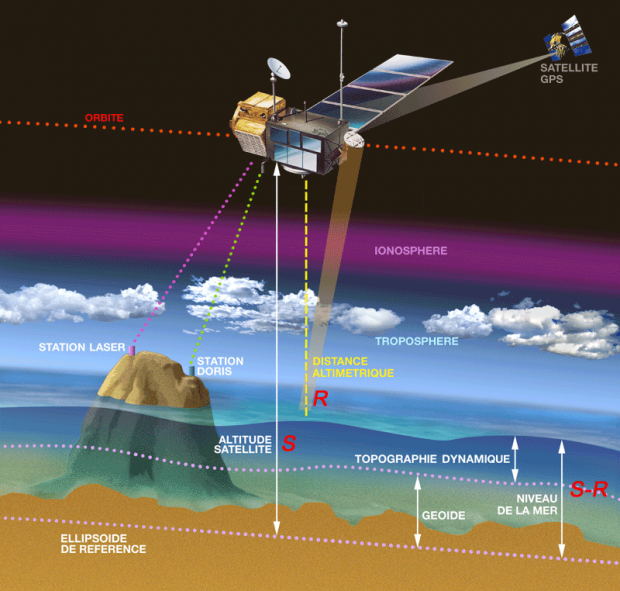 But Earth’s atmosphere slows down the signal, so altimetry measurements are skewed. Eric Thouvenot, SARAL-AltiKa Programme Manager at CNES. Credits: CNES. Another advantage afforded by operating at higher frequencies is greater accuracy. “AltiKa will measure ocean topography with an accuracy of 8 mm, against 2.5 cm on average using current-generation altimeters, and with a spatial resolution of 2 km—that’s 3 times better than its predecessors,” says Eric Thouvenot. “AltiKa will provide accurate measurements of ocean topography, particularly near coastlines. It’s important to be able to acquire valid data near land masses because more and more applications are now focusing on coastal areas,” he underlines. How the DORIS system works: data are sent to the SSALTO multi-mission processing centre. Credits: CNES. Besides oceanographers and climatologists, glaciologists and hydrologists are also eagerly awaiting more accurate data than ever before on glaciers, inland seas, lakes and rivers>. With the aid of the DORIS orbit determination system, AltiKa will be able to measure the topography of these continental expanses of water without signal disruption from surrounding terrain. If there is one weak point, it is that “high-frequency radar waves are extremely sensitive to rain, even drizzle,” Eric Thouvenot acknowledges. “But, statistically, we expect to lose only 10% of data. And some scientists believe they can interpret attenuation and distortion of radar waves by rain to derive new information,” he says with amusement. Proposals can now be submitted, particularly on the AVISO website. Credits: AVISO. What is certain is that AltiKa data are going to interest many research teams. CNES and the Indian Space Research Organization (ISRO) are soliciting proposals until 15 February. If everything goes according to plan, the SARAL satellite, carrying AltiKa and an Argos-3 instrument2, will be launched late 2010-early 2011. “We’re confident this project is going to succeed,” concludes Eric Thouvenot.